If you really want to make your career in Surat? then you are at right place. 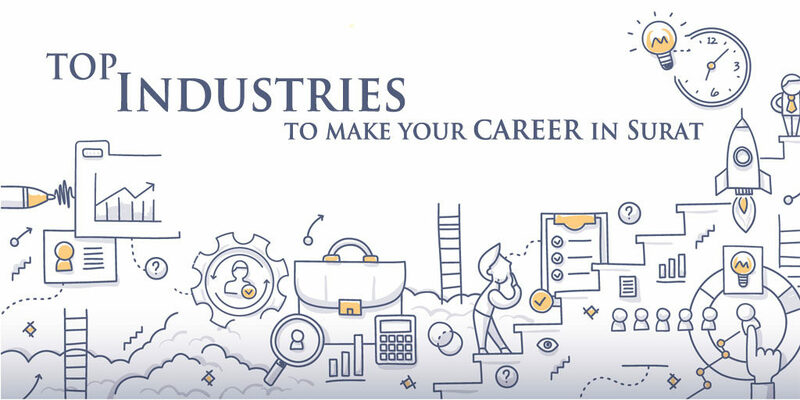 Before planning your career in Surat you should know about Top Industries in Surat. After that, you can start searching job in Surat. If you are thinking about industry wise job opportunities in Surat city, then first Textile industry comes in mind and second Diamond industry. These two sectors where anyone can get a job whether they are literate or illiterate as in these sectors all sorts of job opportunities are available. If you are educated you can get a job easily in the textile industry. You can join as a junior accountant, HR Executive, BDE, Textile Designer etc. In textile, a casual worker may get a job in different markets as hundreds of big markets are situated in Surat city. You may get a job as a storekeeper, packer, parcel supplier etc. If you want to start your own work you may become a commission agent whose main work is to arrange a meeting between a seller and a buyer, and if any deal is done between these two, you will get a fixed percentage of the total sale amount as commission. So, if you are interested in textile industry jobs then just contact us and we will notify you about interviews of all available textile jobs in Surat. If you are an educated person you can easily get jobs in diamond industry like the textile industry. You may get a job in accounting, HR (human resource), BD (business development), Engineering Service or Video Editing department if you have knowledge about the basics of these domains respectively. If you have done any specific course related to the diamond field then you may also get a job in diamond polishing, assortment etc. Thousands of workers get the job to polish a rough diamond and paid on per piece basis. So if this domain attracts you and your interest grow in this industry then you should first find out top 10 diamond companies in Surat and then apply for Diamond jobs in Surat. Apart from diamond and textile sector, No doubt many other sectors are there in Surat at Hazira location where many big companies are doing their business like Reliance, Essar, ONGC, L&T etc. where also many employees are working as per their knowledge, skills, and experience. So, if you are very serious about your professional life and want to secure your career in Surat then you should contact us as we are one of the best job consultancy in Surat Gujarat. We provide individual career counselling in Surat.